Finishing Line Press, 9781944899684, 46pp. Nancy Corson Carter's welcome new book is a rich feast. Accompanied by evocative old photos, the poems recreate how it felt to grow up on a farm in central Pennsylvania. Without sentimentalizing or preaching about a way of life long gone, Carter's poems make your mouth water and your heart expand as her grandparents and parents come to life as we read. The book ends with the lines "I remember I remember " and she makes us remember, too. "Their smiles are genuine," she observes of one of the photos-and so are Nancy Corson Carter's poems. -Peter Meinke, Poet Laureate of Florida *** Touched by nostalgia, but formed from precise observations, these poems consistently evoke engaging reminders of a nearly vanished way of life. 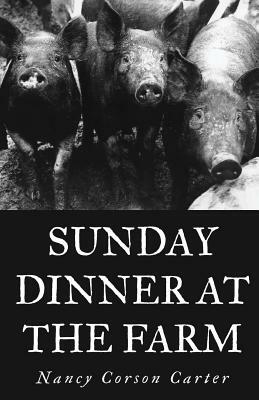 -Gary Fincke, author of Bringing Back the Bones: New and Selected Poems, Charles B. Degenstein Professor of English and Creative Writing, Susquehanna University *** In Sunday Dinner at the Farm, Nancy Corson Carter writes of the rich life she remembers on her grandparents' farm. These wonderful poems brim with keenly observed details-heritage apples, spicewood tea, dandelion wine, shoofly pie, garden harvest, dates written in the family Bible. These poems bring to life a previous time and place and especially the two hard-working grandparents: Your worn brass bed: / under its quilted curves lie/ ghosts of embraces. The family photographs that accompany the well-wrought text give insight into the author's memories and make the collection a delight to read and cherish. -Coyla Barry, author of The Flying Days and two chapbooks, Creature and Creature, winner of the 2001 Harperprints Competition, and Swimming Woman: Poems from Montana.